At Seattle Mosaic Arts, our commitment is to create a supportive shared space where people can come and work independently but in community, side by side, piecing together. Studio Membership offers great experiential learning. You get one-on-one instruction each step of the way, working at your own pace. We offer a wide range of Member’s Advanced Trainings to help support your on-going development as a mosaic artist. We offer two levels of studio membership. The Basic Level is designed for folks who are excited by mosaics as a creative outlet or hobby. The Professional Level membership is geared towards artists working at an advanced level and creating works for sale and shows. 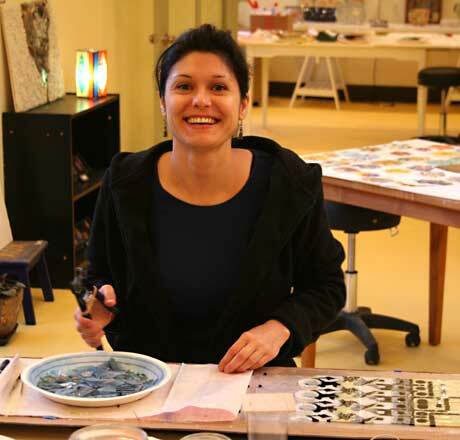 For mosaic artists who already have a studio, but want to be part of the Seattle Mosaic Arts community and to foster mosaic arts in the Pacific Northwest, we also offer an annual Supporting Member Level. To begin creating mosaics at the studio, please contact us to arrange a New Member Orientation. As a member, you have full use of the studio, glass, tools and supplies during open hours. We are here to help and encourage you in any way that we can. Create your own projects – the sky’s the limit. We have lots of bases for sale but we also teach you what makes a good base for you to repurpose as a mosaic. Store your mosaic in progress in our space. Pay only for the materials you use. As a member you have the option of having us do the finishing (cementing and grouting) or to do your own finishing once you have taken the Cementing and Grouting Training. Special Member Trainings to match your needs as your skills and interests grow. Advanced sign-up opportunities for Visiting Artist Series and Workshops. Quarterly ”Mosaic Matters” lecture and film series – free for members. Already have a studio to work in but still want to be part of all the SMA community? Support mosaic arts in the Pacific NW and stay connected with other mosaic artists, as well as supporting the community building aspects of SMA. Quarterly gatherings with other members, lectures and other events, as well as opportunities for showing your work.